I will admit that I have no idea who is in the World Series. I am aware that it is happening because it’s on my television every night and has pushed my beloved Glee! and The New Girl back to November 1st..but I digress. Not a sports girl. I am so not a sports girl I actually had to ask my husband if the “baseball one was called the World Series or the Super Bowl”. That’s how awesome I am. However, if you put sports into edible cake..I’m all about it! Just like this grooms cake which is a bat and ball combo. I don’t know the back story on this couple or this cake or anything–but doesn’t it look like it’s a guitar as well? I am not a music girl. In fact I am about 75 times more a sport girl than an instrument girl..so who knows really. I could get all technical here and tell you how I think the bat looks like the “stringy thingys” and how that “little black thingy at the bottom looks like the thing on the Guitar Hero guitars that makes you get more points”. Jealous of my guitar knowledge? What do you think? 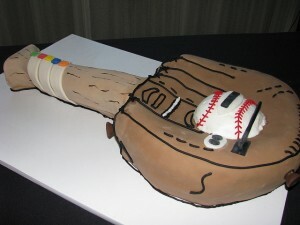 Is this a baseball/guitar cake or am I just crazy?